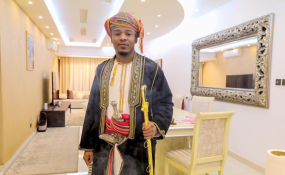 Celebrated Tanzanian musician, Ali Saleh Kiba, popularly known as Alikiba, has lost his father. News of the demise of Alikiba's dad, Mzee Saleh Kiba, was shared on Thursday by Tanzania News outlet, Clouds TV in tweet. According to reports, Mzee Saleh died on Thursday morning while undergoing treatment at the National Hospital in Muhimbili where he had been admitted. "Tanzia: Baba wa msanii AliKiba @officialalikiba (Mzee Saleh Kiba) amefariki dunia alfajiri ya leo katika Hospitali ya Taifa Muhimbili alipokuwa amelazwa. Taarifa juu ya mazishi zitatolewa baada ya ndugu kukaa kikao. Inna lillahi wainna ilayhi rraajiun. Pole sana kwa familia ya KingKiba," Clouds TV's tweet read. Alikiba's younger brother, Abdu Kiba, who is also an artiste, confirmed the demise of their father with details of his planned burial on Thursday evening according to Islamic laws. "Mwili bado umehifadhiwa Muhimbili na msiba upo nyumbani Kariakoo. Mazishi yatafanyika leo saa 10 jioni katika maakaburi ya Kisutu," Abdu Kiba said. It's understood that the old man had been ailing for some time now and had been receiving treatment but the condition worsened and he was rushed to Muhimbili where he passed on. Alikiba, who showed his support for the 14 Riverside Drive terror attack victims by posting the Kenyan flag, has since posted a black blank post on his Instagram account with the caption 'Mipango ya Allah'. Friends and well wishers have sent messages of condolences to the bereaved family. Among those who condoled with the Kiba family is Wasafi TV which is part of Diamond Platnumz business empire.